WORKSHOP SIGN-UP - Wareh Art Inspired by Nature . So you think you can't paint? This 3 hour session will leave you with a finished beautiful painting of that one scene you've always wanted to paint. Bring your own photo of the canyon, a place you've been to, or choose from the photos available in class. Learn the tricks of the trade, from how to hold a brush, to how to be able to see what the layering paint process entails. Set your intimidation aside, and come have some fun. Ages 12 and up. 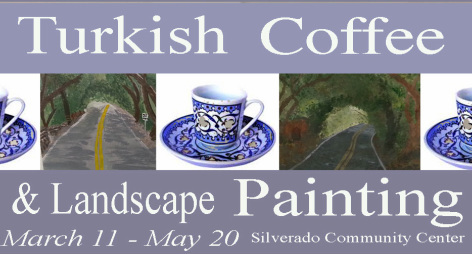 Enjoy Turkish Coffee while you paint! Please include $25 for each class if you are paying in advance. Please note that on-site registration is $30. For the entire series, please include a check for $125.